An adrenaline rush can come from anything. Whether it be from skydiving, going on a rollercoaster or playing sports, having that spark of energy is a great feeling of freedom. 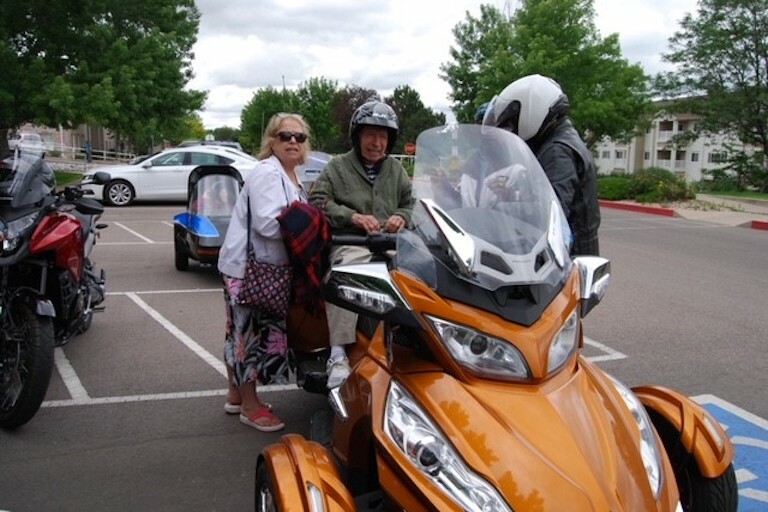 At The Bridge at Colorado Springs in Colorado, some residents get that thrill from motorcycle rides. 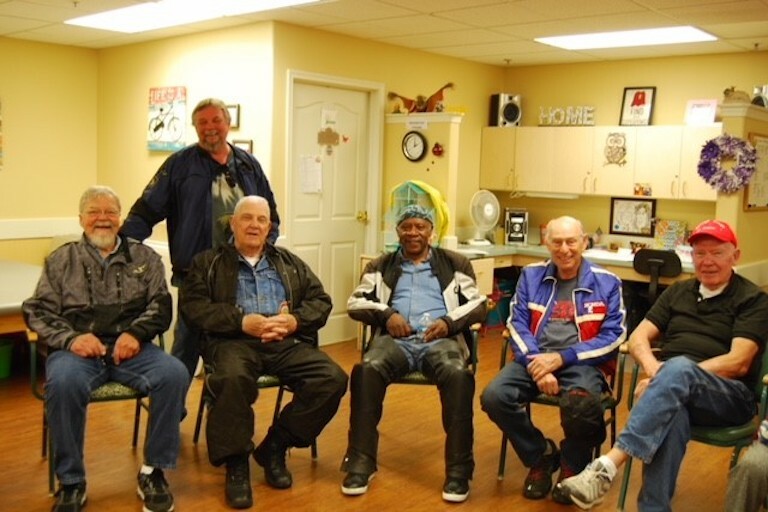 For the past 10 years, motorcycle members of the CO-I Chapter or the Goldwings, have dedicated their time to putting smiles on the faces of residents at The Bridge. Each year they kick their kickstands up and ride to the community to give residents fun and safe rides. 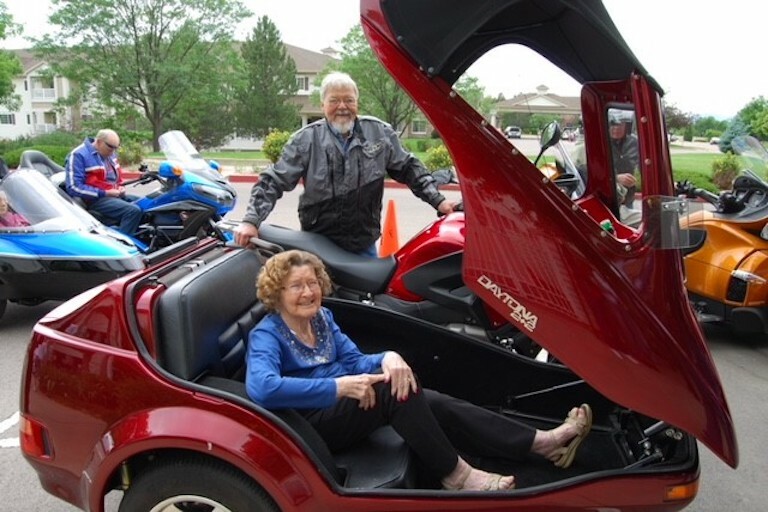 A Goldwing couple at The Bridge, Claude and Nancy Lockhart, shared their adventures of several trips they have taken on their Goldwing motorcycle. As they were telling about their expeditions, their friend Flora Holmes told them she had never ridden a motorcycle before. Holmes said she would love to try riding a bike like that. The Lockharts began thinking of how they could make this possible for her to ride on their bike. It was no problem as long as a waiver was signed, but they wanted to take it a step further by giving other residents the chance to ride. After talking to the lifestyles director, they contacted the Goldwings to see if they would join in, and they agreed. The first year only four residents signed up. There were three bikes and two trikes provided to give rides. After other residents watched and saw that the bikes were safe, they decided to sign up too. At the end of the day the residents took 17 rides. The ride event started growing every year after that. Within the following years, The Bridge reached out to a local sporting goods store, and it volunteered two side cars for the event. Because of the growing thrill of riding, there were 34 rides given that year. One resident loved the ride so much that she wanted to go again, and this time she wanted to go faster. Claude told them to stop as it started to sprinkle rain. This year the weather was a little cool, and clouds were rolling over the mountain. It looked like rain in the distance, but the Goldwing’s hope was to give rides before the rain hit. The rain did not stop the eager residents as they started to get seated on the patio. The residents greeted the motorcycles with a “Welcome Goldwings! We love you!” sign as they paraded into the parking lot. 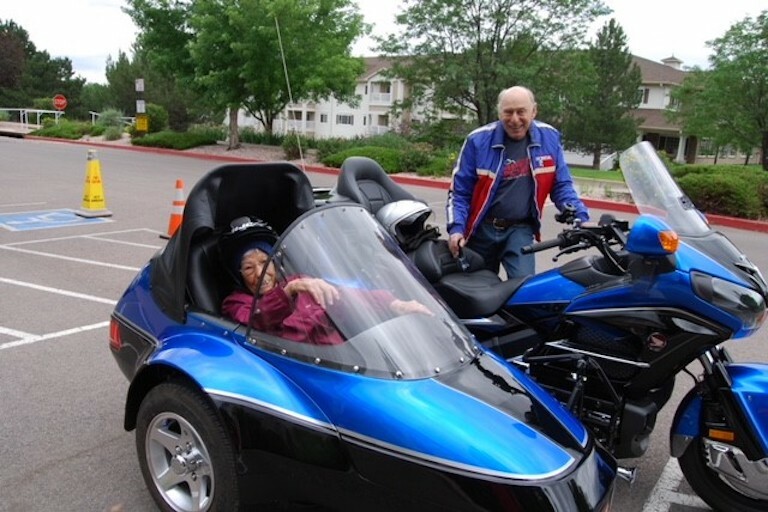 Residents aging from 82 to 99 suited up for the ride. Most residents rode in sidecars for easier access, except for one 99-year-old resident who climbed on the Can-Am with the cyclist. 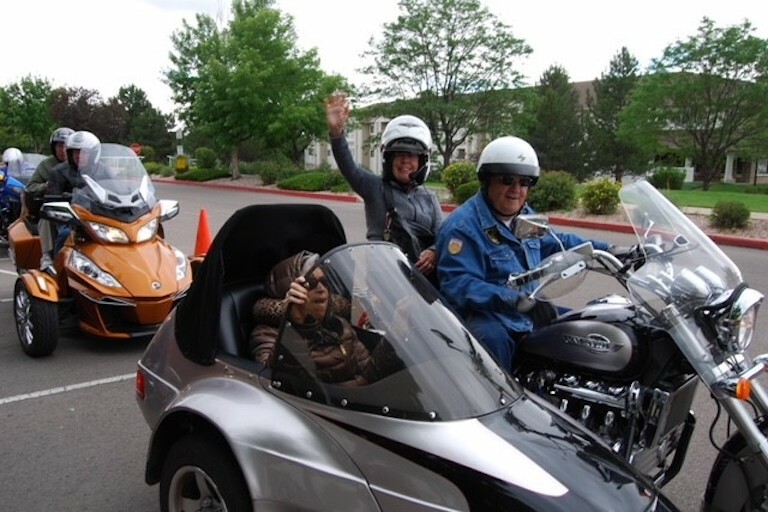 Another resident named Fern rode in the sidecar with her daughter. Claude rode solo and led the pack around Memorial Park. Just as the last rides came in, so did rain clouds, forcing them to end their day of riding. Even though the residents wanted another ride, the fun did not stop there. 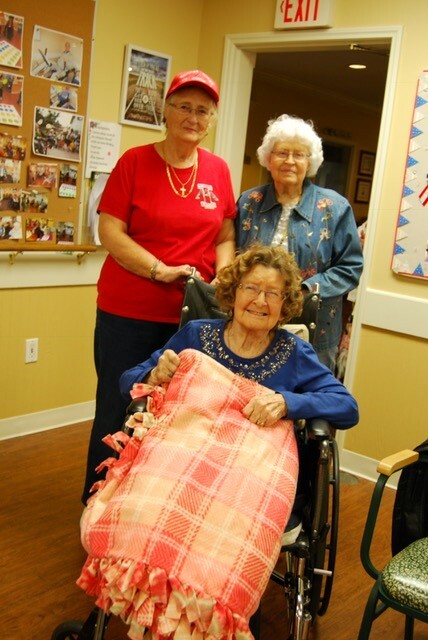 Everyone had ice cream, and there was a drawing for a handmade fleece blanket made by one of the Goldwing ladies. Fern was the lucky winner of the blanket. The Goldwings just rounded 10 years of giving rides to The Bridge residents, and they plan to continue this event. They have given rides in all types of weather. The event usually takes place during a Sunday afternoon on the last week of May or June. Sometimes, non-residents will come to watch and end up wanting a ride too. Everyone who has volunteered has made a difference in the lives of many residents. The Bridge is tremendously grateful for its volunteers and staff who make this event amazing for the residents.